“Cage-free” farms are just as squalid, severely crowded, and stressful for hens as any other farm. After a visit to a supplier of Nellie’s Free Range Eggs, PETA revealed that 20,000 birds were jam-packed so tightly into one shed that it was difficult to avoid stepping on them. Consumers should be horrified to know that Prop 12 still allows tens of thousands of hens to be crammed into giant warehouses and does nothing to prevent routine cruelty, such as grinding up live baby chicks at the hatchery. Birds can be given as little as 1 square foot of space each, the same amount that the farming industry already requires for “cage-free” labeling. One study found that up to 86 percent of hens on “free-range” egg farms may incur broken bones. 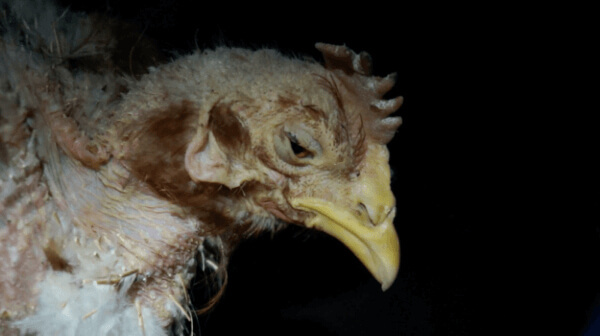 Farms can use a term such as “cage-free” and still employ the same inhumane methods found on conventional farm prisons, such as sourcing chicks from hatcheries that cut off the beaks of young chicks with a burning-hot blade. Farms manipulate hens’ food as well as the light in the sheds in order to make their bodies produce many more eggs than they would naturally. After about two years in these cramped, filthy conditions, their bodies are exhausted and their egg production drops. These “spent” hens are shipped to slaughterhouses, where their fragile legs are forced into shackles and their throats are cut. The bar was set so terribly low for Prop 12—we can and must do better. This initiative will mean that kind consumers will be misled into thinking that it’s “humane” to purchase eggs. The only way to reduce chickens’ suffering is to stop supporting the egg industry by simply not eating eggs. We are at a pivotal moment in pushing for animal protection and animal rights. More than ever, PETA and our supporters must advocate for a vegan world whenever possible. Initiate actual change for animals by speaking out and taking action. Canvas your neighborhood with anti-dairy posters and vegan leaflets. Slap warning-label stickers on animals’ flesh during your next grocery run. Ready to get involved? Demand complete animal liberation by joining PETA’s Action Team today.